Possibly the only thing tougher than persuading a resistant audience to pass up the comfort of mindless summertime CGI for an Iraq war film (even if The Hurt Locker is the best film of 2009 so far) is to talk viewers into taking a chance on yet another Keira Knightley costume drama. Yet, the way that Kenneth Branagh just can’t seem to get enough of the Bard-- Keira Knightley can’t seem to pass up the opportunity to delve into the past to bring a decidedly welcome and long overdue her-story view of history, even if audiences didn’t flock to her most impressive work as a mature performer to date in last year’s underrated The Duchess. Although when you take into consideration the fact that modern Knightley has delivered us the Tony Scott exploitation picture Domino, I think you’ll stand with me in applauding her decision to carefully consider her material and she’s in great hands here especially when you realize that not only is she re-teaming John Maybury who directed her in The Jacket but also that the fact-based screenplay was penned by her mother Sharmon Macdonald. 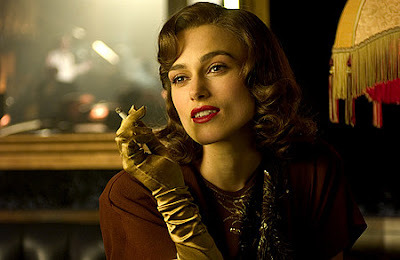 While it’s easy for some critics to cry “nepotism,” Knightley only worked to facilitate getting Maybury on board as director for four years of pleading to implore the filmmaker to read the script, initially unsure she even wanted to take part in the movie’s ensemble as well. However, when she made the decision to do so, her choice of roles surprised her mother immensely as she’d imagined her daughter in the role initially that was signed onto by actress Lindsay Lohan before her departure left room for Sienna Miller to swoop in and deliver yet another emotionally heartrending turn in a role that garnered Miller a Best Supporting Actress nomination at 2008’s British Independent Film Awards. 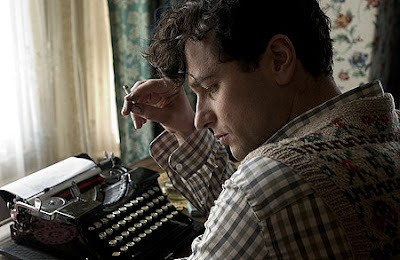 Despite the powerhouse cast that also includes Irish actor Cillian Murphy (Batman Begins, Red Eye)and TV’s Brothers and Sisters Welsh born star Matthew Rhys as one of the twentieth century’s greatest poets Dylan Thomas-- the production titled The Edge of Love never received a wide theatrical nationwide run most likely because of chilly audience reception to costume dramas and period pieces, not to mention that Dylan Thomas probably wouldn’t be a big selling point to consumers in the twenty-first century even if he’s frankly a supporting character in a work which uses him as a focal point to study the friendship of two key women in his life during World War II. However, this is definitely not the same movie and it is also not a Dylan Thomas movie which you’ll be able to perceive from the startling, near wordless trailer (save for the very end) that just lets long-time David Lynch composer Angelo Badalementi’s music play amidst some breathtaking imagery that Maybury garners through his cinematographer Jonathan Freeman in a unique blend of old fashioned techniques like iris cuts with new overlapping edits such as when we see the eyes of Rhys’ Dylan Thomas peering over the honeymoon bed of his first, childhood love Vera (Knightley) that she shares with the earnest, good-hearted soldier William (Cillian Murphy) before he heads off to war. As the movie opens, we’re thrust directly into the heart of a war-torn London in 1941 where the sky is raining down bombs so steadily that the masses have sought shelter underground in a nearby tube station where Welsh born Vera Phillips (Knightley, bravely doing her own singing live) tries to keep their spirits up by performing in brightly colored gowns, amidst glowing lights, and glamorous décor for the soldiers and citizens including the ardent admirer Captain William Killick (Murphy) who repeatedly returns to make her acquaintance. 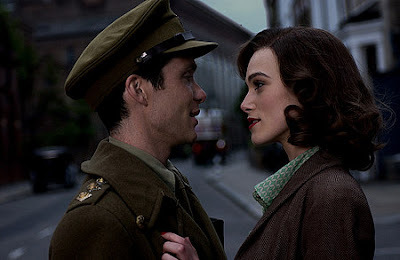 While Vera is hesitant to melt at the sight of a man in uniform since they might die, her face beams when she’s reacquainted with her childhood love Dylan Thomas (Matthew Rhys) who—unable to fight in the war due to grade three lung sicknesses—has been hired to write soothing propaganda scripts for the BBC. Not letting him get away with his altered, self-conscious posh accent—that famous Thomas speech rhythm English majors and poet fans have come to recognize in an instant with his powerful affected cadence—they fall back into easy conversation but it’s challenged quickly when Caitlin, the beautiful, passionate, and reckless wife he neglected to tell her about arrives. And what an entrance it is given Sienna Miller's wondrous introduction as she gamely flirts with every soldier boy in sight. However, instead of the two getting into a dull jealous rivalry routine—they know their man well enough to know what he’s like and to know that most likely they’d have something in common as well and the two women become fast friends, with Caitlin doing cartwheels in a bar to get the attention of William Killick when Vera refuses to give him the time of day. After getting kicked out of Caitlin’s sister’s place for Dylan’s appalling, drunken behavior—the Thomas couple shack up with Vera and Dylan seems to relish the excitement of being able to ask both women he loves to “give us a cuddle” at any moment. Yet Caitlin lays down the law that although the husband and wife are unfaithful-- as a friend of both-- Vera is strictly off limits which proves to be a greater challenge to Dylan as Vera spends more time with William and eventually marries the man, to Dylan’s increasing jealousy that he can’t possess both women he wants. But when William’s off to war and Vera discovers she’s pregnant, the three move back to Vera and Dylan’s native Wales where Vera uses her money (and William’s) to support them in two neighboring cottages. And despite the picturesque beauty of the idyllic countryside, emotionally this new setting is as dangerous as any landmine filled battlefield when Dylan sees nothing from stopping him and Vera herself becomes lonely and emotional given the new child. And indeed it's a passionate, well-acted film that overall centers on as Maybury states “an emotional love affair between two women” or more correctly “the way that women, particularly in this period, but I think it’s still true today, sacrifice their intimate friendships with each other for the men in their lives." 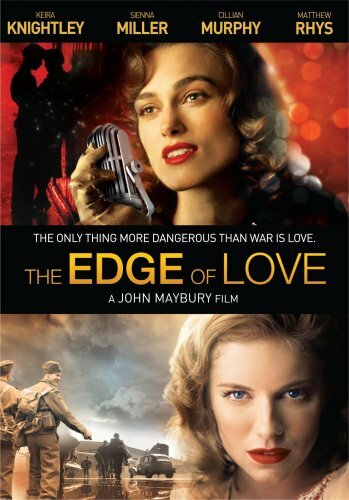 Moreover, The Edge of Love comes from a personal place for the filmmakers as the producer of the film is the granddaughter of Vera and William Killick who based the work on the book Dylan Thomas: A Farm, Two Mansions and a Bungalow which some of producer Rebekah Gillbertson’s aunts had been involved in that focused on the relationship regarding her grandparents and Dylan and Caitlin Thomas which ended in controversy. Although those picking up for the film simply because they believe it’s a Dylan Thomas biopic will be heartily disappointed since again, he’s a vital part of the film but it is an ensemble or quartet work and the men take a decidedly backseat to the great turns by the female leads. And overall, it’s a rather simple story-line— essentially an anecdote in the life of Thomas— but one that's supremely well told and The Edge of Love is well-worth your time. 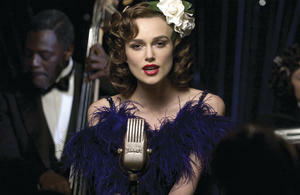 While it goes without saying that once again you'll be startled by the naturalism of Knightley in yes, another costume piece as she proves she can sing-- this time around you'll be mesmerized by Sienna Miller who continues to dazzle. Launching into the most difficult and multi-layered role in the film—having to at times convey six different emotions within seconds of jealousy, sadness, bravery, whimsy, humor, and at last just peace—just like Factory Girl, Casanova and Interview, she’s an absolute marvel and makes me all the more eager to see another film that flew under the radar via the adaptation of Michael Chabon’s first novel, The Mysteries of Pittsburgh coming soon. The DVD picture quality of Love is very impressive although I did have to crank the audio track to hear the mumbling dialogue. Also featuring a filmmaker and actor commentary with Maybury and Rhys as well as a brief featurette—one where Knightley’s enthusiasm is so apparent that poor Miller only gets to utter a single sentence as Knightley accidentally steps over all of her co-star’s chances to speak—the disc also includes the aforementioned impressive trailer and oddly enough outtakes which mostly consist of mess-ups involving the cast and the endless amounts of cigarettes and lighters they had to use throughout the period film.